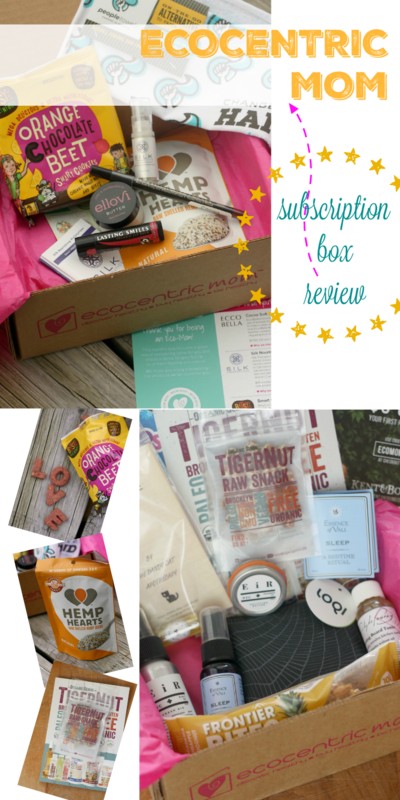 Just over a month ago, I featured the Ecocentric Mom Subscription box and told you to be on the lookout for an upcoming review. Well, guess what today is? You guessed it (you're so smart) — review day! I wanted to wait until a couple of boxes into my subscription to share my thoughts. 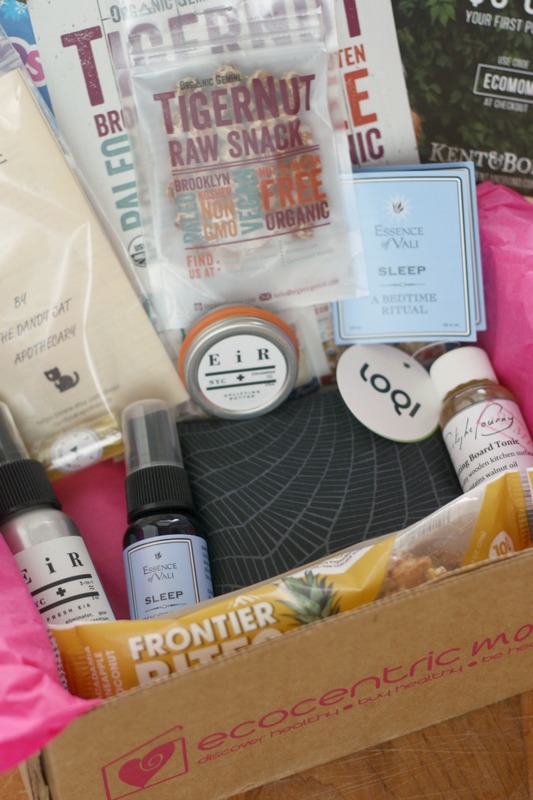 I'll start out by saying that I think subscription boxes are a fun way to get acquainted with a company or product by allowing you a taste of what "could be" were you go all-in. I like trying before buying, so I get a little giddy when I open up my mailbox to find a box of goodies waiting for me. For each of the two boxes that I'm about to show you, I'll list the products that they contained, a brief description of those products, and my thoughts and/or experiences with them. 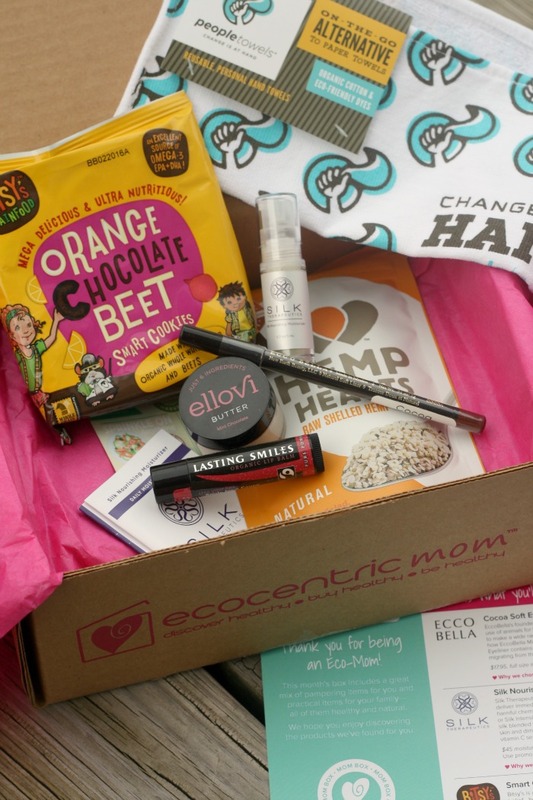 Oh, in in case you don't remember (or didn't see) my other post, I should tell you that there are 3 types of subscription boxes available through Ecocentric Mom: Pregnancy, Mom & Baby, and Mom—because mama deserves a little pampering at any stage. Pampering! Since I'm not pregnant and my kids are no longer babies, I chose the "Mom" Box. Each box comes with anywhere from 5 to 9 goodies. The key to Silk Therapeutics' beautifying products is right in the name— the company uses real silk in their formulas, which lets in oxygen while also forming a barrier against damaging elements. Silk replaces the silicones and harsh chemical additives used in other beauty products. In the Nourishing Moisturizer, silk is blended with hyaluronic acid and antioxidants to diminish signs of aging. Use daily and your skin will thank you with its radiance. my thoughts: This stuff is great. It smells natural (and reminds me of my younger days when I let my hippie chick shine). My skin soaks it up and there are no grease slicks left on my skin...it just feels (wait for it) silky. Many of Ellovi's products double, triple, and quadruple as other effective solutions, and their Butter Minis are no different. Ellovi understands that your skin is like a sponge, and that adverse environments can be just as damaging to our bodies as what we put in them. The body butters are also sunscreens, makeup removers, and face moisturizers. my thoughts: This smells EXACTLY like you're rubbing an Andes Mint into your skin. You decide whether or not that's a good thing. Great for hungry winter skin, but it is a bit greasy, so I wouldn't want to use it if I'm wearing (or working with) a delicate fabric. Nice if I'm in my jammies getting ready for bed, though. Formulated with ultra-nourishing ingredients, Lasting Smiles will keep your smile glowing all day. We love the social mission of this company (a portion of proceeds go straight to cleft lip surgery funds for children, changing their lives for the better), and the balm is a great every-day staple to keep stashed in your bag. my thoughts: I'm a lip balm fanatic (I wanted to say a different word there, rhymes with bore)—you'll never find me without it. While the smell was just kind of "meh" and reminded me of kiddie chapstick, this did glide on nicely and leave my lips feeling smooth and hydrated. EccoBella is a top seller for natural makeup, loved by vegans, health nuts, and regular moms and moms-to-be, just like you. EccoBella's founder refuses anything to do with animal testing, so you can be sure your cosmetics and skincare products are as pure and additive-free as your skin craves. The signature of the EccoBella brand is their use of plant-based "neutraceuticals," which naturally moisturize and protect our skin as they make us look fabulous. This FlowerColor Eyeliner contains flower-wax to lock in moisture and keep your eyes smudge-free all day. This eyeliner pencil is the perfect natural alternative to additive-laden eye makeup, and it comes in a gorgeous tan-brown shade that compliments any eye color. my thoughts: All-around good. When I wear eyeliner, it's brown - so I'm happy to add this to my every day collection. Goes on easy, doesn't rub off any more than normal and doesn't irritate my eyes. Mission accomplished. Hemp is a source of healthy protein, and you can fit these hemp hearts into your diet just about anywhere (and it's a superfood). Manitoba Harvest grows, prepares, and sells their own hemp for each product they carry, making them a unique end-to-end company whose name you can trust for quality. 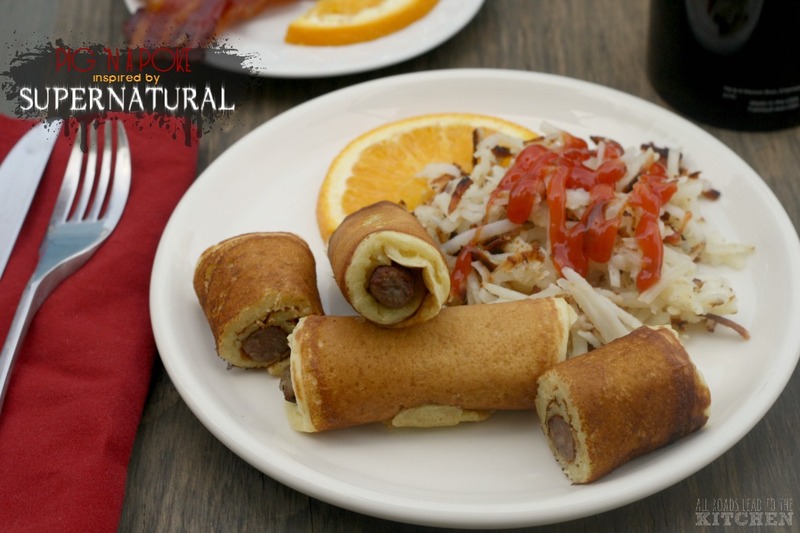 All Manitoba Harvest products are meticulously chosen for potency, taste, effectiveness, etc. They are also a B Corp certified company, which means that they demonstrate a commitment to their employees, as well as the good of their consumers. 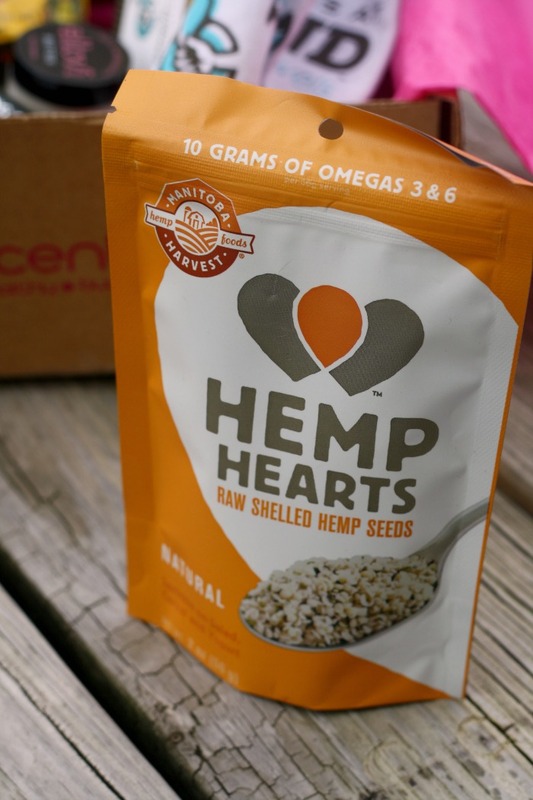 Sprinkle your hemp seeds on a salad, on your morning yogurt, into a loaf of bread of coffee cake, or anywhere you want a boost of protein and nutrients. my thoughts: I was already a major fan of this brand. I almost always have a bag on hand for sprinkling on my toast in the morning (on top of almond or peanut butter), adding to homemade granola bars, or baking into bread or crackers. 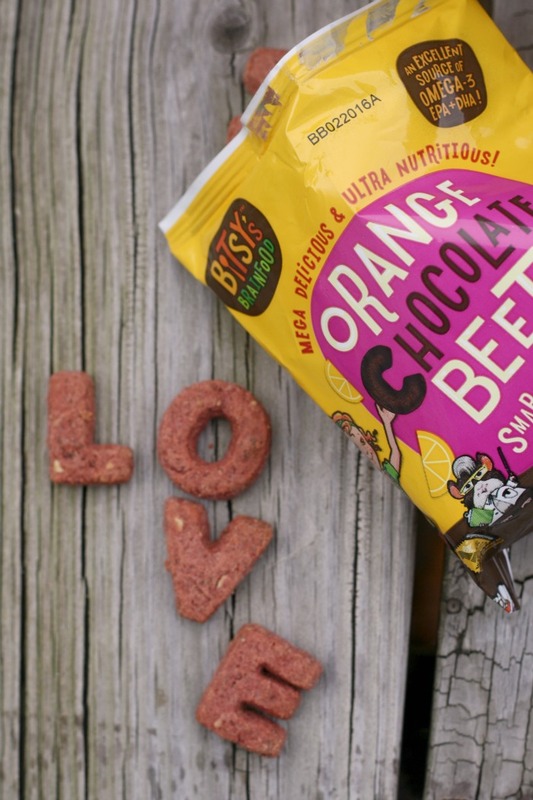 Bitsy's Smart Cookies are created with all-natural ingredients, including added boosts of fruits and veggies. Bitsy's believes that healthy minds and healthy bodies are closely connected, and that you cannot truly have one without the other. That's why they have created products like Smart Cookies, which assist growing brains and bodies, and which nourish busy moms as well. my thoughts: Ew. Sorry, but honestly—we didn't like these. I wanted to. 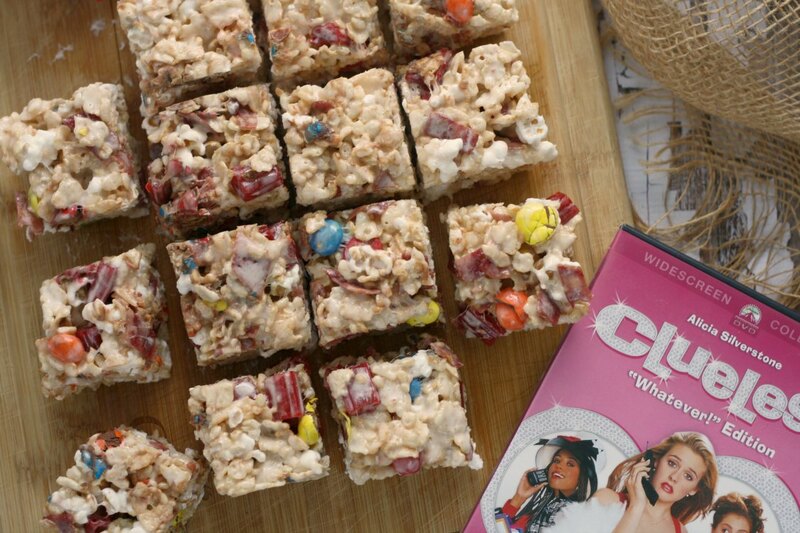 They're adorable and would make great lunchbox snacks, but none of us liked the taste. I won't rule out the other flavors, but the Orange Chocolate Beet will not be making a repeat appearance in my house. People Towels are designed to save your sanity while also saving the environment. Take these towels with you wherever you go, and whether you have your children with you or not, you'll be prepared for any mess that crosses your path. Their reusable towels, such as the Logo a Go Go Towel, come in all sorts of fun prints. People Towels products are created from thin, absorbent materials that are easily washed away, so you can toss them in the wash and get back to your life. my thoughts: These are great for throwing into lunchboxes (kids or adults). I'm a big fan of reusable napkins and towels, so this will get used until it's bare. Moms don't always get lots of sleep, but when we do sleep, it needs to be quality rest. Essence of Vali has a Sleep Soothing Mist that is all natural and made from essential oils. It has soothing essences of lavender flowers, marjoram leaves, cedar wood and ylang ylang petals that's based in distilled water. It's great to use when you feel stressed or to spritz as an air or pillow freshener. my thoughts: The scent is great, very natural, woodsy, and soothing. Like the moisturizer above, one misting of it takes me back to the days when I remembered to embrace my inner hippie chick. This concentrate is the most potent of the Essence of Vali's sleep collection. It's perfect for the busy mom to drop on the pillow right before bed to help make maximize your night's rest. You can also put a drop on a tissue or cotton ball and tuck into the corner of a pillow case. my thoughts: This starts of strong so don't lean in. Really, just use a drop on a small swatch of fabric and tuck it into your pillow case. Definitely relaxing, though. Eir NYC is a high-quality aromatic blend of essential oils and organic herbs. Each of Eir’s earthy elixirs are specially formulated to rejuvenate and safeguard the skin without any harm to your body or the planet. Fresh EIR is Nature’s 3-in-1 deodorizer; odor eliminator, hand sanitizer and gear freshener for your uber-active lifestyle. Spray on body as a deodorant, palm as hand sanitizer, or on sports gear as an odor eliminator. my thoughts: Admittedly the idea of being able to use the same product as a deodorant, hand sanitizer, and odor eliminator skeeves me out a little bit...but I'm nothing if not open-minded. This has a very "piney" (due to the cypress and rosemary components) and masculine scent, which is not necessarily a bad thing. So far I've tried it as a hand sanitizer and an odor eliminator. I don't think I'm going to go for it as a deodorant, though. I kind of like it. This luscious butter is made with coffee oil, cypress and rosemary essential oils. This balm combats cellulite and water retention and promotes circulation. It's chemical and paraben free. Your skin is going to drink in this rich butter especially since winter's setting in and the cold is already wrecking havoc on our skin. It's a win for mom's everywhere. my thoughts: Much like lip balm, I have a healthy addiction to body lotions, butters, and creams. This butter is nice and thick, but my skin seemed to soak it up (so no greasy stuff just hanging out on the surface). It's also piney like the spray, but it has coffee undertones. Weird, right? Yet somehow, it works. Loqi bags are water resistant and OEX-TEX certified which means it's been verified that it was made in a n eco-friendly way. They're slogan is perfect for the busy mom- "Strong like a man, loyal like a dog, eco-friendly, chemical-free, long lasting, washable. And extremely good looking." You're going to love the Loqui Tote. my thoughts: Okay, this is becoming a theme, but I'm also a hoarder of bags. I'm always on the lookout for bags that are both useful and attractive, and this one fits the bill. It's strong for being so thin and it folds up nicely so that I can tuck it into my purse almost undetectably. Tonic No. 2 is a mixture of 100% naturally-derived vegetable, fruit, and plant oils that can be used as a facial skin cleanser, makeup remover, moisturizer, serum, facial mask and body treatment to achieve desirable results in both you health and glow of your skin. my thoughts: Seriously, these eco-boxes are reviving something inside me that I'd let get buried. 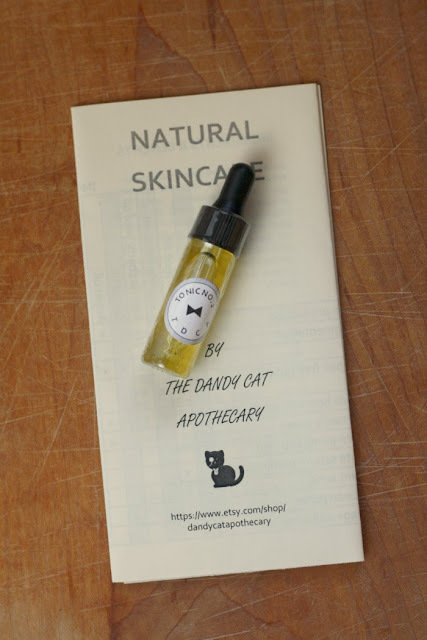 I love patchouli (seriously), and this tonic has it. Best of all, it doesn't smell like I'm trying to cover up any debauchery, it's nice and subtle and rides my skin nicely. I like this for rubbing into my elbows. Mixed in small batches in Brooklyn and made with food grade ingredients, your Cutting Board Tonic is a natural way to moisturize and clean wooden surfaces in the kitchen. 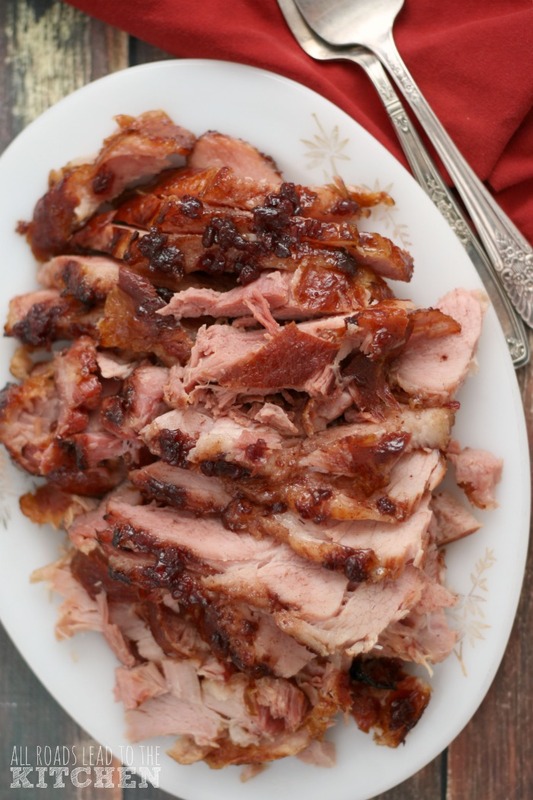 It doesn't contain mineral oil or alcohol and is made with food-safe ingredients. It's great to use on butcher blocks, cutting boards, wooden bowls and utensils, or any wooden surface in the kitchen. my thoughts: I need this. I've needed it for years. It's hard to tell if it's making a difference on my old neglected boards, but I can't wait to buy a new one and condition it like it's supposed to be conditioned. Frontier Bites are healthy snacks for mom's looking for nutritious crave-able snacks made with simple, real food ingredients. 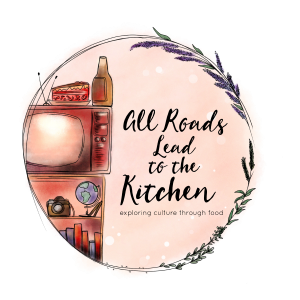 They offer a big bang of energy and nutrition in every bite to help fuel your every day adventures of being a mom. 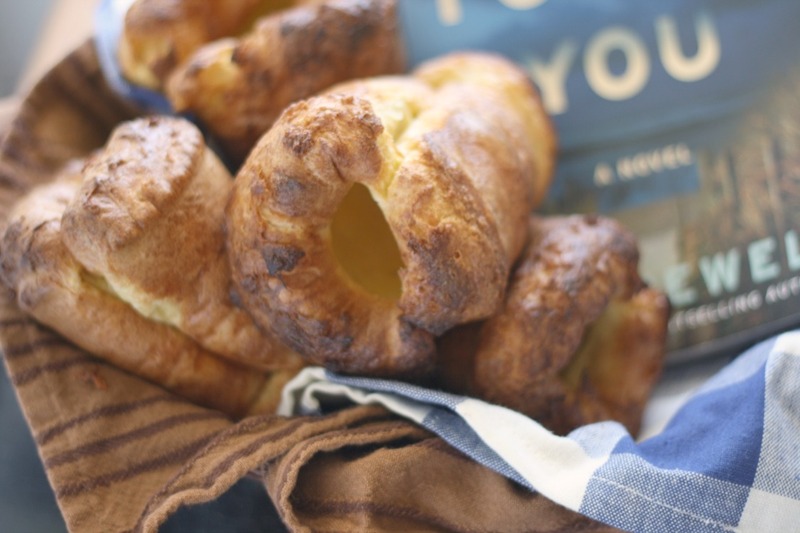 These bites are made with just 8 ingredients and are Gluten free, soy free, Dairy free and non-GMO verified. my thoughts: They're good. Not mind-blowing, but I'd throw some into my bag for nourishment if I'm on-the-go. All Brooklyn-based Organic Gemini TigerNut products are Kosher, organic, Non-GMO, gluten, dairy and nut-free, plus vegan, and raw. They are a prebiotic that resists digestion and will help your body to naturally develop probiotic bacteria ensuring a strong immune system. 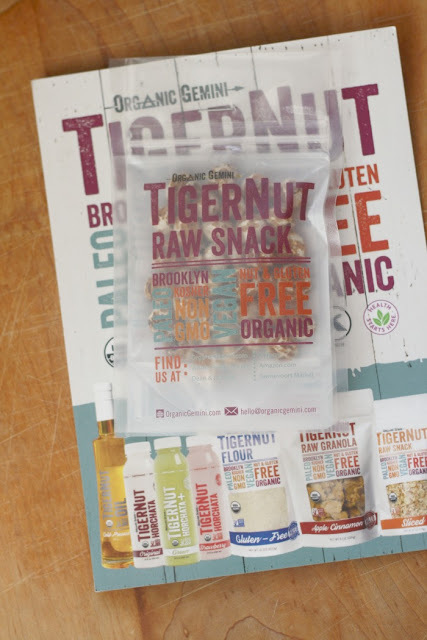 TigerNuts are also high in iron, potassium, magnesium, and Vitamins C & E. Stick them in your bag for a snack on the go. my thoughts: Oh my gosh, I LOVE these! I love the chewy texture and the flavor, and my mind is blown by the fact that they are a tuber. 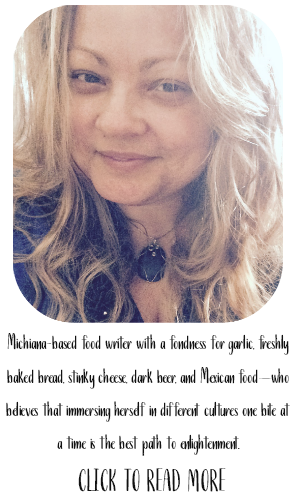 I do admit to feeling a bit like I'm in a movie when I'm eating them (the whole paleo food of my ancestors thing). It makes sense in my head. Really. I will definitely buy these. Speakaboos is a digital storybook platform that motivates children ages 2-7 to read, explore, and discover stories they love based on their interests. Their stories feature rich illustrations, animated characters, story-driven games, and touch-screen interactions that bring favorite stories to life and keep children engaged through active learning. Designed to motivate children to read anytime, anywhere, Speakaboos can be enjoyed on computers, tablets or mobile devices at home or on the go. my thoughts: This is a cool idea. I haven't activated it yet, though. My youngest is 11, so I'll be passing this on to my sister who has 4 boys that (all!) fall into this age range. I enjoyed both months of the Ecocentric Mom Subscription Box that I received—even though a few things weren't things I'd buy again. I mean, that's kind of the point isn't it? Trying new products to see if they're a good fit. I also like that the boxes are a good mix of things I've heard of and new-to-me products. Oh, another cool thing that I forgot to mention is that each box comes with a product information card. The card tells why they picked the products to share, a description of the product (including the product web address), pricing of the product, and discount codes for purchasing the things you really love! Would I subscribe to this box on my own? Yes, I definitely would. To learn more about the Ecocentric Mom subscription boxes, visit their website. If you're already sold and know that you want to give it a try (for yourself or as a gift), head over to the website by clicking HERE, and get $10 off a 3 or 6 month subscription if you order by January 3rd, 2016! This post contains affiliate links (if you sign up using the links just above, I can earn incentives in my eco-mom account. You can do the same by registering at their site). I received 2 complimentary months of ecocentric mom boxes in exchange for my honest review as a part of the US Family Guide Moms Connect Network.